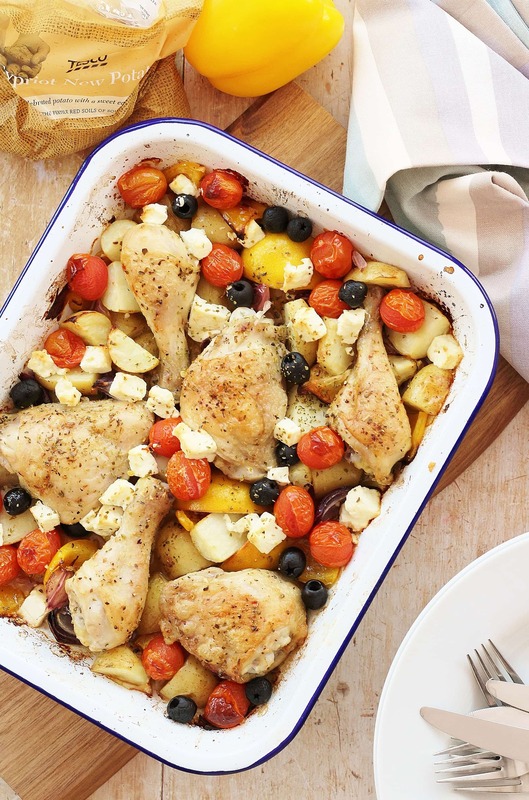 A simple midweek chicken dish, made with Tesco Cypriot New Potatoes, this Greek Chicken Traybake can be prepared in 10 minutes, making it perfect for busy days. A couple of weeks ago I was offered the opportunity to review Tesco Cypriot New Potatoes – these creamy, earthy new potatoes are already in season in Cyprus, meaning new potatoes can be enjoyed even in the middle of our cold and rainy British winter! These new potatoes are from the ‘spunta’ variety and are delicious boiled, steamed, roasted or even baked. Cypriot New Potatoes are available in Tesco stores nationwide from now until the end of March, both loose and in 750g packs. I wanted to create a dish that captured the sunny, summery mood of Cyprus where these lovely new potatoes are from – a dish to take us all on a virtual summer holiday! Now, regular readers of Easy Peasy Foodie will know how much I love traybakes – I love throwing some potatoes, vegetables and meat into a tray – popping it in the oven and letting the oven do the work of transforming these ingredients into something wonderful. Well, I have had the idea of doing a Greek-style chicken traybake for a little while – I’ve done a Greek-style lamb traybake before, but I’ve never tried to create a chicken version – until now. I felt this would be the perfect opportunity to try out the idea! I often use new potatoes in traybakes and knew this would be a great way to show off the delicious flavour and texture of Tesco Cypriot New Potatoes. New potatoes work really well in traybakes as they don’t need any par boiling and they cook quickly – in about 40-50 minutes depending on how small you cut them and how hot your oven is. Roasting them in the oven really concentrates the flavours giving that delicious roast potato flavour, plus cooking them with the chicken means they absorb all those lovely chicken juices – kind of like roast chicken and roast potatoes without the hassle! 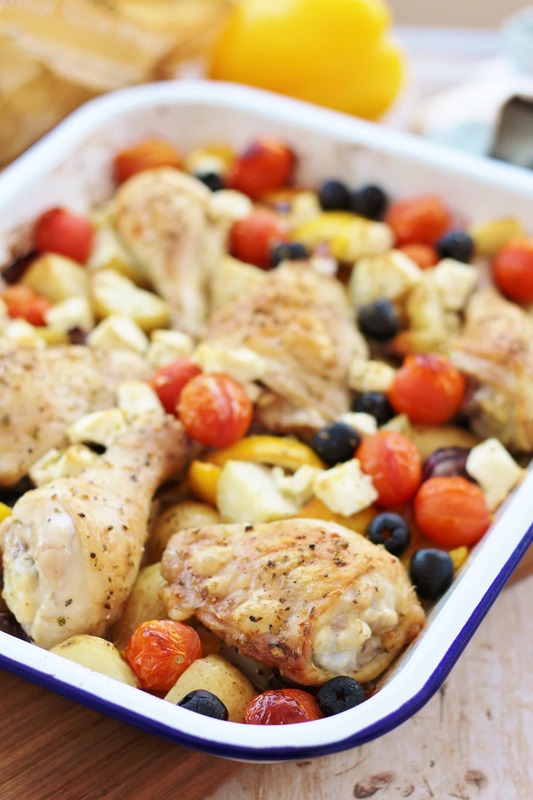 Both the chicken and Cypriot New Potatoes go beautifully with the typical Greek flavours of oregano, lemon, feta and black olives, making a delicious easy peasy alternative to a traditional roast chicken dinner. Cook this Greek Chicken Traybake at the weekend for a lazy roast dinner or cook on a weeknight for an easy peasy midweek treat. The delicious lemony flavours of this Greek Chicken Traybake would go beautifully with a citrusy Sauvignon Blanc, or a Sauvignon Semillon blend such as a white Bordeaux. Or, if you prefer red, a Beaujolais would go well here too. Preheat your oven to 200C / 180C fan / gas mark 6 / 400F. 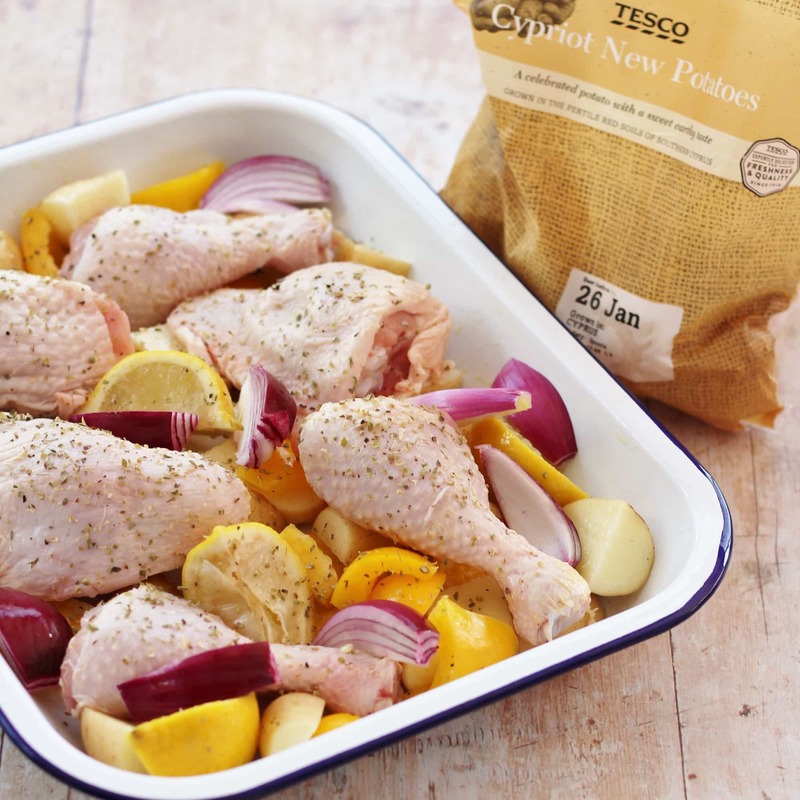 Put the new potatoes, garlic, red onion, yellow pepper and chicken in a roasting tin. Sprinkle with salt, oregano and black pepper, then drizzle over the oil. Squeeze the lemon quarters over everything, then add them to the tray. Mix everything together and then rearrange in one layer with the chicken on top, skin side up. Roast in the preheated oven for 30 mins. Add the cherry tomatoes, olives, and feta. Return to the oven for another 20 minutes until the new potatoes and chicken are cooked through. Serve just as it is or with a green salad. Not suitable for freezing (except the chicken on its own IS suitable for freezing). This is a collaborative post. For more information on collaborative posts please read my disclosure page. Hahaha – thanks Corina 🙂 Maybe I should make myself a badge for my site???!! Ooh wow, you traybake queen you! Looks gorgeous – stunning pictures Eb! If only Mr E & I weren’t vegetarian – but at least we can happily sub the chicken in it for a vegetarian alternative. And hurrah for feta – it had to be added being a greek inspired traybake. I love a recipe where all you have to do is plop stuff on a tray, put in the oven and serve! You’re my kind of girl! Thanks for joining in with #FreeFromFridays. So many flavours in one dish! This must be super delicious, Eb! Amazing recipe!